Our pipe chain clamps for welding alignment have been designed to offer the welder or pipefitter the best of both worlds, firstly a clamp with the strength and ability to align and lightly reform pipes and secondly, lightweight design and construction for ease of use. 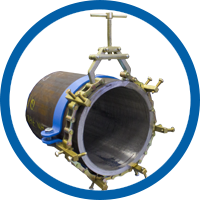 One clamp can fit a wide range of sizes and the entire circumference of the pipeline can be welded without removing the clamp. Each clamp for aligning can fit-up elbows, Tees, Flanges, End-caps and most of other fittings. 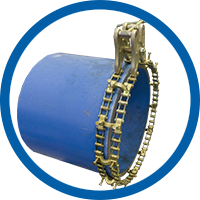 All pipe chain and screws are zinc pasivated to eliminate weld spatter and corrosion. Stainless steel models are also available. A high tensile offers a safe alignment of the pipe. Jackbars, jackscrews and chainlinks are available seperately to modify the clamp to smaller or larger diameters. To change the jackbars only a tong or a ratchet is necessary.